Cuban artist Yoan Capote balances a broadly conceptual, experimental artistic practice with the realities and histories of his native Cuba. He adopts different materials to more closely express his far-ranging ideas, searching for intellectual, and perhaps physical, freedom from a culture isolated by the sea. He is part of a new generation of artists testing the limits of the changing political atmosphere of Cuba, and of the changing attitudes towards Cuba in the world. 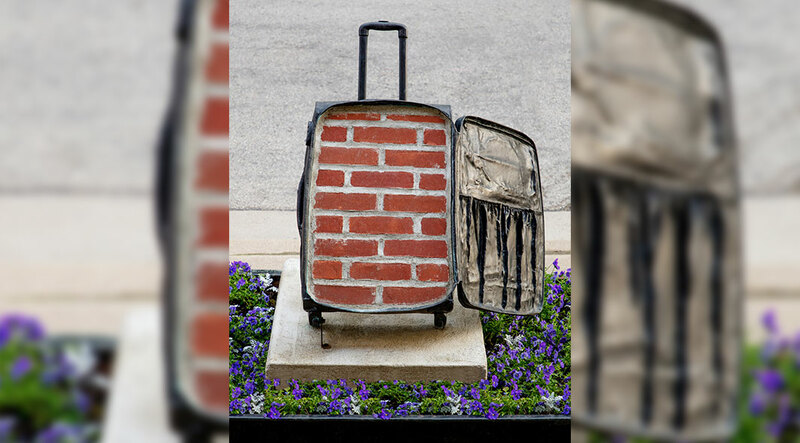 For Nostalgia, 2013, the artist cast his own suitcase used while traveling from Havana to New York. The interior space of his suitcase is closed off with the bricks of Manhattan, like a window closed to the outside world. Nostalgia embodies, in a poetic manner, the situation of travel for immigrants. Our bags can contain memories and bare necessities, as well as bittersweet memories of those left behind. While we may look to travel to provide life-changing adventures, for many, the suitcase may be weighted with an irrecoverable past. The distance between Cuba and the continental United States is not far, but it represents a wide chasm—of politics and history, of discovery and forgetting. Capote, born in Havana, currently lives and works in his home town. He studied at the Provincial School of Art, Pinar del Rio, Cuba, from 1988-1991; attended the National School of Art, Havana, 1991-1995; and graduated from the Higher Institute of Art, Havana, from 1996-2001. Recent gallery shows have been held in: Easthampton, Havana, London, New York, Paris and Pinar del Rio, Cuba. His work has been shown in group exhibitions at: the Ludwig Forum für international Kunst, Aachen, Germany; the Museum of Latin American Art, Long Beach, California; the Pérez Art Museum, Miami; the Museum of Fine Arts, Houston; the Hirshhorn Museum, Washington; the Walker Art Center, Minneapolis; and the Bronx Museum of Art. Major biennials and festivals include: Nuit Blanche, Toronto; the 11th Havana Biennial; the 54th Venice Biennale; the Thessaloniki Bienniale of Contemporary Art, Greece; and projects in Italy, Panama, Portugal, Slovenia, South Africa and Switzerland. He has received awards and fellowships from: the Guggenheim Foundation, the Pollock-Krasner Foundation, the Mattress Factory, the Cuban Arts Fund and UNESCO.